Last winter’s events are an interesting case study in the differences between pricing dynamics in the French and German power markets. The Winter of 2016/17 will be etched in the annals of European power market history. A string of safety related outages highlighted Europe’s dependence on the 63GW fleet of French nuclear plants as a cornerstone of its capacity mix. The resulting generation shortfall drove extreme price volatility in France and sent shockwaves through interconnected neighbouring markets. We have already written about the price shocks over the current winter in the UK power market. Today we look at last winter’s events as an interesting case study in the differences between pricing dynamics in the French and German power markets. French power prices are structurally higher than in Germany, with a baseload price premium of around 6 €/MWh in 2018. This premium is driven by winter peak prices where France utilises gas-fired generation, both from within its borders and imported from neighbouring markets, to satisfy demand. In contrast summer prices are typically set at the German border, with the variable costs of coal and lignite plants being the predominant driver. Chart 1 shows the evolution of generation margins for coal and CCGT plants in France since 2013. This puts the price shock of the current winter in perspective. As the scale of the nuclear outage issue became apparent in Sep 2016, French spot power prices spiked higher. The concept of power prices rising above variable fuel and carbon costs is often referred to as a ‘scarcity premium’. This is a rather loosely used term that often reflects theory more than reality. In addition in some periods of more severe tightness, individual generators (or interconnectors) actually gain pricing power. This is a function of a reduced level of competition to provide the marginal MW, amongst the available sources of capacity. These situations can lead to quite extreme price spikes with the market pricing up towards expensive balancing alternatives or ultimately towards the value of lost load. Periods of significant pricing power tend to be short lived until more normal levels of supply competition are restored. As a result of surging Q4 power prices in France, both clean spark and clean dark spreads jumped and remained at elevated levels across Q4. But as 2016 drew to a close and nuclear capacity returned, spot prices & spreads reverted to more normal conditions. French power prices have continued to weaken this year, helped by unusually warm spring weather, with France experiencing the warmest March weather for more than one hundred years. Forward French spark and dark spreads are hovering around zero across the summer. But baseload prices for next winter currently sit at around a 9 €/MWh premium over Summer 17. 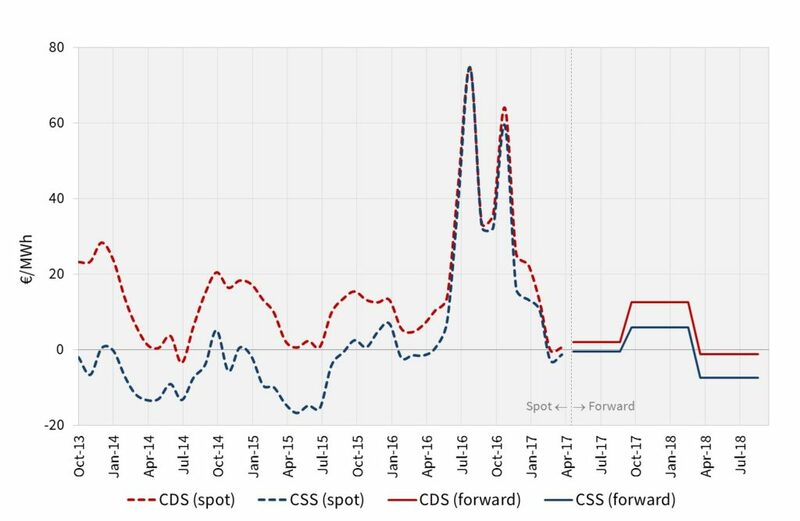 Behind this premium is the requirement for gas-fired plants to run across the winter peaks, reflected in forward peakload spark spreads which are currently around 17 €/MWh. Price setting in the German power market is dominated by coal-fired generation capacity. Over the last 3 years German power prices have declined, helped by robust growth in low variable cost wind and solar output. Over the same period gas prices have declined relative to coal prices. These factors have combined to drive a convergence in the generation margins of coal and gas fired plants in Germany. This can be seen in Chart 2. German CCGT margins have been in negative territory for most of the last 5 years as generation output is dominated by lower variable cost coal capacity. But as the French market tightened in Sep 2016, German CCGTs were required to help make up shortfall. Chart 2 shows German spot spark spreads temporarily recovering into positive territory in 2016. However the price impact of French nuclear outages was much more subdued in Germany. German power prices rose as the French market imported more German power. But at the point that available interconnector capacity became constrained, pricing across the two markets separated, with German prices and generation margins remaining at a substantial discount to France. Forward spark and dark spreads remain very lean. This is a function of the continuing role out of low variable cost renewables and a current overhang of thermal capacity. 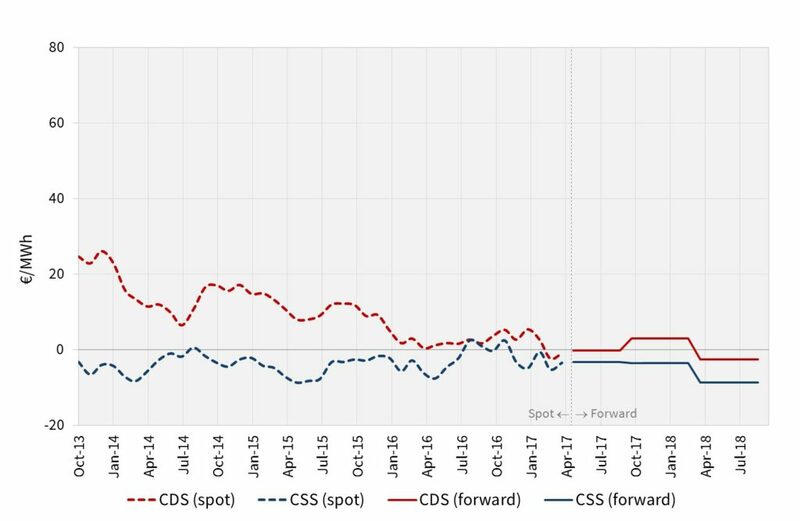 Higher spot price returns are likely to precede a structural recovery in forward spreads. Last winter’s events illustrate the dependence of European power markets on the French nuclear fleet. If nuclear safety issues resurface, higher prices and volatility will return. The winter price shock also seems to undermine current French election pledges for a major reduction in nuclear output by 2025. Political debate has conveniently sidestepped the resulting impact of higher prices on French industry and consumers. The events of winter 2016 were also an indication of how conditions in North West European power markets may change into the 2020s as capacity retires. Germany alone is set to lose a huge volume of capacity by the early 2020s given regulatory and economic retirements. The German Association of Energy and Water Industries (BDEW) estimates 26GW of nuclear and thermal plant closures by 2022. This highlights the challenge North West European power markets face over the next five years. The rollout of renewables continues at an impressive pace, but this intermittent capacity requires flexible backup. Market price signals currently do not support existing flexible capacity, let alone development of new capacity. This suggests higher prices and volatility are going to become a more regular feature of European power markets.